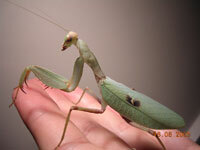 Sphodromantis is a normal- type mantis and a common inhabitant of terrariums. Especially the females can become big and heavy. Also the strong arms are typical for this genus. Sphodromantis inhabits bushes, branches of trees, meadows, but also populated regions. The aggressiveness is very high. Thus just young nymphs (up to L4/ L5) can be kept in groups. Also adult males should be single- kept. At present, at least 42 species are described, e.g. Sphodromantis balachowskyi (LA GRECA, 1967), S. centralis (REHN, 1914), S. gracilis (LOMBARDO, 1991) and S. viridis (viridis) (FORSKÅL, 1775). Sphodromantis is easy to keep and to breed and are especially suited for beginners.